The one, the only, the ultimate! The cut-up technique helps inspire ideas. It began with the Dadaists who would write words on paper, cut it with scissors, and then scramble the pieces to see their own words fall together in surprising ways. In this updated version, you search keywords to pull random texts from the Internet. From there you look into this "world wide haystack" for needles of juxtapositions that maybe, just maybe, might strike that wondrous chord of inspiration. The "random spaces" option is there to help break up the density of the results. And "chunkiness" controls the number of words randomized at a time. 1 means every word is randomized. 2 keeps the results in word clusters of 2. 5 keeps them in clusters of 5. Etc. The traditional version is also included. With that you can paste your own text here instead of searching the web. 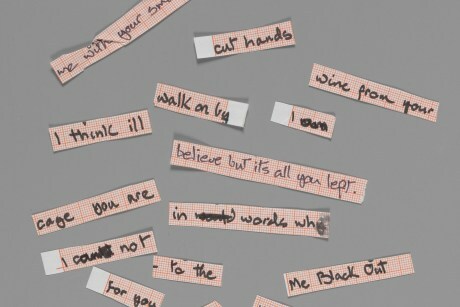 Cut up of David Bowie's "Blackout", from the 1977 album "Heroes". Photo credits: David Bowie Is, copyright Victoria and Albert Museum.